Rare Bird: A. Lange & Söhne Cabaret Yellow Gold. The Rectangular Unicorn Watch from the Masters of Saxonian Watchmaking. One of the least desirable timepieces from A. Lange & Söhne and what could be considered a unicorn amongst the Lange lineup, the Cabaret is one of those rare birds worth talking about. 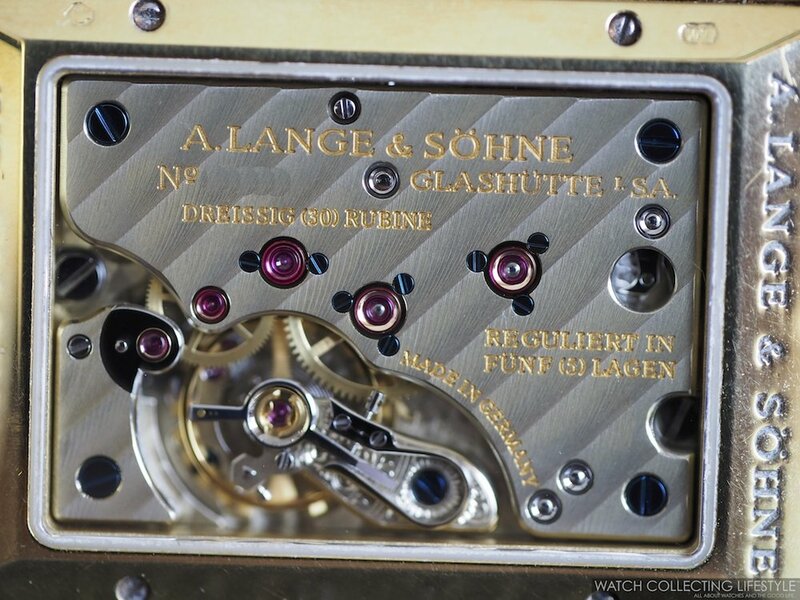 Released during the rebirth era of A. Lange & Söhne, this timepiece was introduced in 18K rose gold, platinum, 18K white gold and very scarcely in 18K yellow gold. Launched as a men's watch and fitted with a rectangular case measuring 36.3 mm x 25.5 mm, this wristwatch was definitely better suited for women rather than men. Released with a solid silver dial with oversized date aperture at 12 o'clock, running seconds at 6 o'clock and applied Roman numerals and romboid markers, the Lange Cabaret had a short history in the life of the brand as it was discontinued around 2011. With a somewhat art deco look, a double step angular bezel and powered by the manual wound calibre L931.3, the Cabaret is rare, unpopular and the perfect entry level Lange for those wanting to claim they own an A. Lange & Söhne. Its beating heart created in German silver can be admired via the display case back. The movement, calibre L931.3 which beats at a frequency of 21,600 vph features a three quarter plate, 30 jewels, swan neck regulato and provides a power reserve of 42 hours. Equipped with an alligator strap with pin buckle, the A. Lange & Söhne Cabaret is a great looking watch for the price and one of the discontinued Lange timepieces that will always remain a unicorn but a good example of what the early beginnings of the new era at Lange looked like. Regardless, this timepiece is still well made and very representative of the work done by the masters of Saxonian watchmaking. If you find one, expect to pay anywhere between $10,000-14,000 USD based on the availability of box and papers and the overall condition of the watch. Posted on January 4, 2018 by Editor & Publisher and filed under A Lange Sohne and tagged A. Lange & Söhne Cabaret Yellow Gold A. Lange & Söhne 2018 Rare Bird Mainstream Brands Most Popular.